Waterfalls have always been an inspiring sight and these 12 tallest and largest waterfalls in the world are among the most inspiring of them all. Waterfalls have always been impressive to humans. Similar to the 15 largest bodies of water in the world, people have gathered on their shores and considered them spiritual places. Waterfalls have a special place in many local legends and myths. When David Livingston first laid eyes on Mosi-oa-Tunya (Smoke that Thunders in Tonga language) in 1855, he was in awe. He was so impressed with the sight that he named it Victoria Falls. Unfortunately for Queen Victoria, Zimbabwe government isn’t quite taken with the name and has started an initiative to rename the waterfall. Whatever you call it, this waterfall didn’t make it to our list, despite being among the largest waterfall in the world in terms of water flow, at its highest point it is only 355 feet (108 metres) high. Another awe-inspiring waterfall that lacks the height to be included on our list is Niagara Falls. With six million cubic feet (168,000 m3) of water roaring over its edge every minute, it is more than twice the size of Victoria Falls. It is also about twice as low, with 167 feet (51 metres) of maximum height. Some of the largest waterfalls aren’t visible anymore. They have been submerged when the rivers they are on were dammed. Guaíra Falls were last seen in 1982 when the lake created by Itaipu Dam was formed. Celilo Falls on Columbia River shared the same faith in 1957 when Dalles Dam was finished. Along with the waterfall, Celil Village, the oldest continuously inhabited community in North America vanished, ending 15,000 years of people living on the spot. 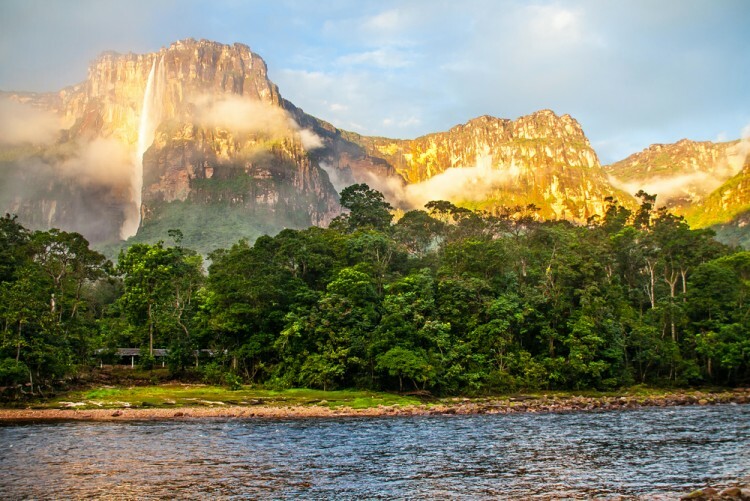 These 12 tallest and largest waterfalls in the world are probably safe from being submerged. Their height, measured in thousands of feet, make it impossible to build a dam and harness their power. That way at least some of them will survive so that future generations may be impressed with them as much as we are.